Heated pool, beautiful beach. Days at the Docks Festival weekend is April 27-28, We have an opening April 26-May 4th. Also Memorial Day week, Saturday-Saturday at much better price than peak summer. The private heated pool is now open at 82 degrees (pool heat optional). We keep pool open from March to Thanksgiving. Spring & Summer are booking very quickly, with many repeat renters plus new ones. Not every family can juggle schedules to take a full week vacation. They can still enjoy Pelican Watch as I have three 5-night stays open in July and August. Only open summer full week is June 16-23. Fortunately we had no damage as Hurricane Florence devastated parts of eastern North and South Carolina with flooding and I pray for the safety and continued recovery for those in the damaged areas. Fortunately, Holden Beach and our two homes sustained only minor nuisance damage and fresh water flooding in the yards. We were very fortunate. I personally spent two days preparing our two homes for Florence, and two days undoing the prep work and removing some water which seeped in and readying Pelican Watch and Hold-on-Beach for renters who arrived as soon as beach re-opened to visitors. Don't let your dates get taken by someone else. Hold-on-Beach, our similar home, but NO private pool, also has open weeks (VRBO 114090) this spring into next summer and fall. Pelican Watch is luxurious, nicely decorated private oceanfront home with elevator, now with many multi-year repeat customers. Spring and Fall are great times to try out Pelican Watch at reduced prices. Enjoy the beach or curl up with book from our extensive library. Call owner for 'couples' and/or multi-week discounts. Solar blanket and southern exposure (w/ heater optional /surcharge applies) will warm the private pool. Take a short walk over dunes to broad beach. Pelican Watch is named in honor of the brown pelicans who fly by on the updrafts from ocean winds off the dune-ridge along the beach. House has 4 bedrooms, 3 facing oceanfront, 3.5 baths inside, & enclosed outside shower w/ hot/cold H2O. Glass-paneled back deck off small sitting area on main living area offers privacy/protection from ocean breezes and great views of Lockwood Folly Inlet. Both our homes are on the lightly developed "East End" of Holden Beach. I grew up with a family beach house at Edisto Beach, SC. Love the Carolina coast. Holden Beach is not at all like Myrtle Beach. We built this house in 2008 and incorporated improvements on the design of our other very nice house, Hold-on-Beach, vrbo #114090. . We love the East-End of Holden Beach so much, we are now on our third house in the neighborhood. We designed and built Pelican Watch for long-term enjoyment and eventual retirement. Heated pool really extends pleasure to almost 9 months. Special design and open space, visually from glassed back deck to stunning ocean views from both living levels. Elevator serves top floor (main living level) from parking level. Inverted floor-plan. Private heated (optional) pool is open from March to Thanksgiving. Pelican Watch is in very lightly developed area of east end of Holden Beach. 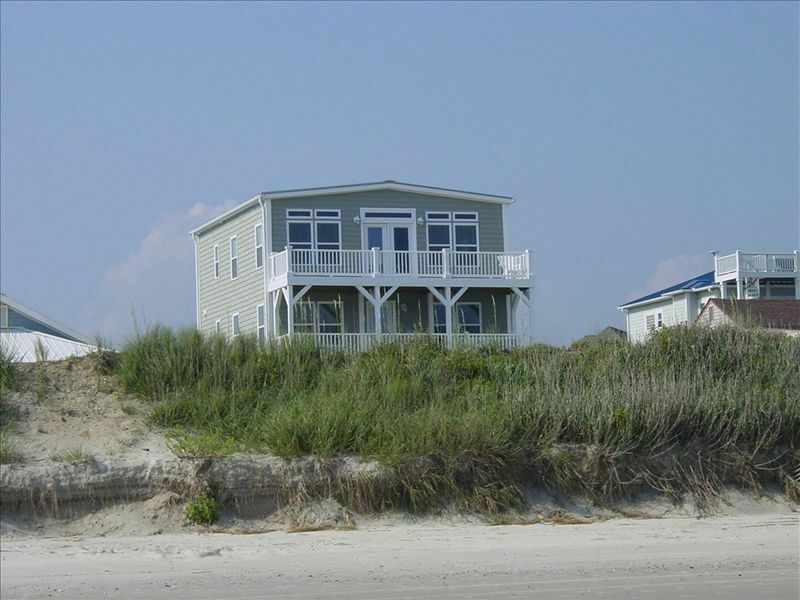 House is raised very high, wonderful views from both floors, over limited-use one-way street, dunes to beach. Wooden stairs cross-over across dunes about 125 ft from yard. Linens available, you wash, dry & fold before departure. Or we have preferred provider who will deliver and pick-up for $10 per bed.. If you use our towels, you launder and fold before check-out. We don't provide 'beach' towels. Elevator serves top floor which has one master bedroom, dining / living / kitchen. Elevator does NOT stop at lower level with 3 bedrooms. Living room and main level is on top floor. Great beach ocean views. Drip, normally have plenty of filters. Good supply of dishes and utensils. Refrig w/ ice & water in door, fully stocked w/ equipment, utensils, small appliances, spices, etc. Large TV in living room; TVs in 3 of the 4 bedrooms. (4) Main TV in living room and others have 200+/- cable, w/ HiDefinition and premium channels. 3 of the 4-bedrooms have TVs. Wide selection with at least 50 books. Large porches/balconies on both floors (front/ocean side), small back deck on top floor. Thirty or more courses within 40 miles. Private fenced pool in area below two oceanfront decks. Watch ocean and kids in pool from decks/porches or step in pool. Pool heat optional, varies by month. Open March to Thanksgiving. Cable/Satellite TV (4): Main TV in living room has 200+/- cable, w/ Hi Definition. 3 TVs in 3 of the 4 bedrooms. Private Pool: Private fenced pool in area below two oceanfront decks. Watch ocean and kids in pool from decks/porches or step in pool. Parking for RV/Boat/Trailer: Boat /RV parking allowed. NO sleeping/housekeeping allow in RV. Elevator serves top floor only from ground level. Elevator helps with bringing in fresh local seafood and beverages to the kitchen. Serves dining, kitchen, living rm., one Master Bdrm. Covered Parking: Space for 2 to 4 cars under house. No Pets Allowed: Absolutely no pets allowed. Nothing personal, but firm policy. Smoking Not Allowed: If you do smoke outside, properly dispose of cigarette butts, or have part of damage DEPOSIT taken. Pelican Watch is fabulous! It is beautiful, clean, has a fantastic pool, a well-stocked kitchen, and is in a convenient peaceful location. The views from each deck are breathtaking. Do not forget about the back deck-the sunsets are amazing! We had such a great stay not only because of the beautiful beach and house but also because of Irv. He met us upon arrival and showed us around the house and how to take care of the pool-such a nice guy! He was ready and willing to assist with anything that came up during our stay and a very gracious host. Absolutely nothing came up or went wrong during our 10 day stay though! We will definitely vacation with Irv at Pelican Watch again. Thanks, you were great renters, nice people who are welcome back anytime. The heated pool which is open March to Thanksgiving does make the spring and fall more enjoyable, while being especially affordable. Thanks again for your care of my home and nice comments. We had an absolutely wonderful time at Pelican Watch. The heated pool was perfect in March as well as the few short steps to the beach!! The house is gorgeous and you cannot beat the ocean views. This house had all that we needed for our family - kitchen was fully stocked and the amount of pool and beach toys kept my boys totally entertained. We love Holden Beach and look forward to more visits in the future. Thanks so much to Irv for being such a huge help!! Thanks for your kind comments about Pelican Watch. I know you have vacationed at Holden Beach many times and I'm honored by your comments. Your family will be welcomed back! Now that I'm retired with two Holden Beach homes, I take considerable time and pride in working to deliver a great rental experience. We had a great stay at this nice beach house! This house is close to the beach and well maintained. It smells fresh and clean, so that you liked to lie in the beds (not quite natural). Also the owner Irv was very friendly and taking much care of us as the hurricane Florance reached the area. This house and my other are personally owner managed by me, not a management company with unreasonable fees. Supplemental Pool Heat at 82 degrees, pool heat rates decrease from $200 per week in March / April to $100 in May and $75 if desired in June. Fall pool heat ranges from $100 in September to $200 in October and November. Supplemental pool heat is OPTIONAL. Dates available: Year Round 'Couples, 2-people, Multi-week, off-season discounts available Rentals are generally Sunday-to-Sunday. Also some long weekends.